Did you know that Lyme disease is the fastest spreading infectious disease in America? Last August, the CDC upped their official count of new Lyme disease cases in the US annually from 30,000 to 300,000 ~ A TEN FOLD INCREASE. But that's only an estimate of reported cases. Many Lyme diagnoses are not reported. Therefore, the real number is even greater. Lyme is a tick-borne disease caused by the spirochetal bacteria, Borrelia burgdorferi (Bb). While ticks are considered the primary mode of transmission, other insects (mosquitoes, fleas, mites, flies) can carry the Lyme bacteria as well. Lyme disease is found in all 50 states and many other countries including Canada, UK, The Netherlands, Australia, Germany, and China, among others. For more detailed information please read What Is Lyme Disease? Living each day with the effects of this complexed disease can be challenging to say the least. 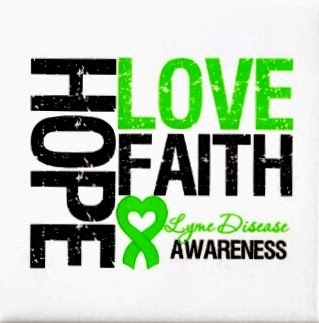 Nevertheless lets keep fighting the good fight, my Lyme Warrior friends. We'll see this through together.